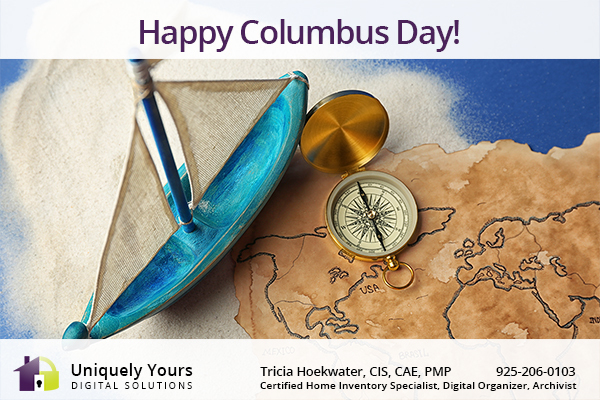 COLUMBUS DAY: The first Columbus Day celebration took place in 1792, when New York’s Columbian Order—better known as Tammany Hall—held an event to commemorate the historic landing’s 300th anniversary. Taking pride in Columbus’ birthplace and faith, Italian and Catholic communities in various parts of the country began organizing annual religious ceremonies and parades in his honor. In 1937, President Franklin D. Roosevelt proclaimed Columbus Day a national holiday, largely as a result of intense lobbying by the Knights of Columbus, an influential Catholic fraternal organization. Take care of yourself…and what you have! Get a home inventory today. Contact me today via phone at 925-206-0103 or by email uniquelyyours@outlook.com to schedule your home inventory today.